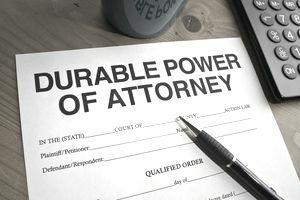 When Do I Need a Durable Power of Attorney Form? When you consider legal forms you might need as an individual or small business owner, be sure to include a durable power of attorney form in that list. Having this form could save your estate and your business if you can’t take care of your own affairs. A power of attorney is a document in which you (the “principal”) designate someone (your “attorney-in-fact”) to act on your behalf. You may give your attorney-in-fact authority to act for you in every situation, or just in one situation. For example, it’s common in a real estate transaction to give a real estate agent power of attorney to act for a homeowner or buyer to sign documents relating to the transaction. Powers of attorney typically end when the person dies, if the POA is revoked by the principal, at the end of a specific time period, or if the person becomes mentally incompetent. A durable power of attorney is a specific type of POA to allow the POA to continue in this last situation of mental incompetence. Mental incompetence is a specific legal term meaning that the person is unable to make or carry out important decisions regarding his or her affairs. Dementia, for example, would be one such situation. You can create several durable power of attorney forms for different circumstances (medical vs. business, for example), as long as they don’t overlap. There are two kinds of durable powers of attorney, based on when the durable power of attorney takes effect. They are the same circumstances as with regular power of attorney forms. One type is called a springing durable POA. This type "springs" into action, that is, it becomes effective, when the person becomes incapacitated. Some states (Florida, for example) do not recognize springing durable POA's. The other type is a regular durable POA that takes effect immediately when the document is signed. Of course, the attorney-in-fact does have authority until the principal becomes mentally incompetent. Don’t confuse a durable power of attorney with a living will. The living will document is for end-of-life or critical care situations. Your durable POA attorney-in-fact should be aware of any living will and may also be named in your living will as the decision-maker. The term advance medical directive (AMD) may be used in some states in place of the designation of a durable power of attorney for medical decisions. It doesn’t have anything to do with other types of durable powers of attorney. As a small business owner, you might want to have a separate durable power of attorney designating someone to handle your business activities if you are not mentally able to do it. Creating a limited durable power of attorney for business financial and legal matters might save your business if you become incapacitated. For example, if you are the sole owner of a limited liability company (SMLLC), the durable power of attorney would give a specific attorney-in-fact the ability to handle the day-to-day activities of your business. Remember to specifically exclude business affairs from any other durable power of attorney you create. List the specific identification of the two parties––the principal and the attorney-in-fact, so there can be no confusion about who these people are. Include the relationship between you as principal and your attorney-in-fact. Describe the limits of the POA in terms of time (if there is an expiration date) or type of POA. This is the place where you can specify whether the POA is for all matters, business matters only, or medical matters only. It’s also the place where you state specifically what the POA does not include. Include a statement that if your mental situation changes and you become competent again (after recovery from a brain injury, for example), the POA expires. Also, include specific instructions for your attorney-in-fact. For example, you might want to state who should be consulted in business or medical matters. Identify these people and be specific about your instructions. Be careful that a medical durable POA and a living will don’t contradict each other. Sign the form in front of two witnesses. These people should be over the age of 18, not be relatives, and should not be named in the document. Some states require that the signatures be notarized. State laws govern all power of attorney forms. Check with an attorney who practices law in your state for details on your state’s requirements and restrictions. A power of attorney must specifically list the authority or authorities being granted, and the agent cannot take any actions that aren't specified in the POA. Please resist the urge to create a durable POA yourself or use a “free” online form. There are several reasons why it's not a good idea to use online legal forms. Getting the help of an attorney is the best way to create a durable power of attorney, to assure that all situations are addressed completely and specifically and that you are following state law. An estate planning attorney or elder law attorney might be a good choice. Each situation is unique and laws change. This information is not intended to be legal advice, and the writer is not an attorney. Get an attorney to help you prepare your durable power of attorney.